For Amorepacific, the last year has been painful in terms of both sales and brand development. The South Korean cosmetics giant saw its operating profit halve to 549 billion won ($491 million) in 2018, just two years after it joined the “1 trillion-won sales club” in 2016 for the first time as a cosmetics maker. With its glory falling to the past, Amorepacific has been outpaced by rival LG Household & Healthcare. LG Group’s cosmetics arm became the newest member of the 1 trillion-won sales club last year, cementing its No. 1 status in terms of market capitalization, which totaled 23.1 trillion won as of June last year. In the fourth quarter of 2018, Amorepacific’s operating profit came to 16.4 billion won, down 82 percent on-year. The company had many reasons to blame for its profit decline, including a rise in the minimum wage, weak performance of its budget cosmetics brand with the advent of numerous competitors at health and beauty stores, e-commerce and even home shopping channels. This has put the brakes on Amorepacific’s drive to construct a beauty industrial complex in Yongin, Gyeonggi Province. In 2017, the cosmetics giant had unveiled its plan worth 163 billion won for the complex to develop cosmetics and beauty products. But the company announced last month that it would scrap its complex project due to dwindling profits as well as fierce opposition from local residents. Market watchers voice concerns that this year will be a make-or-break period for the group, as a continued sales downfall will make it harder for the company to recover from its ongoing slump. “Profit recovery from the domestic beauty market as well as pulling up sales among Chinese customers will be the major points for Amorepacific to overcome this year,” said Na Eun-chae, a researcher from Korea Investment and Securities. Although South Korea-China ties started mending last year after the detrimental diplomatic and economic fallout from the deployment here of the US Terminal High Altitude Area Defense missile system in 2017, the China comeback is still not so evident. Amorepacific’s Sulwhasoo, the company’s flagship luxury skin care brand, had been the most favored brand among Chinese tourists in the past few years. Market data showed that mainland China accounted for at least 10 percent of Sulwhasoo’s total sales, followed by Hong Kong at 6 percent and Taiwan with 0.5 percent as of 2018. But The History of Whoo, the latecomer in herbal cosmetics, has now taken the limelight. Whoo, a luxury skin care brand by LG Household & Healthcare, posted high sales at duty-free shops largely backed by Chinese consumers. This led Sulwhasoo to hire actress Song Hye-kyo as its global brand ambassador, seeking a breakthrough. It was Sulwhasoo’s first-ever attempt to have a celebrity promote its products. In terms of sales, Whoo has outpaced Sulwhasoo by recording 2 trillion won of sales last year. Whoo has also made a 40.8 percent on-year increase. Sales of Sulwhasoo had been around 1 trillion won since it peaked in 2015. “It is not an exaggeration that Sulwhasoo is the only, but very strong, cash cow of Amorepacific Group. It is the most important department in the entire company. Employees, especially in that department, feel grave responsibility and pressure about having to pull up the sales,” an insider told The Korea Herald. According to the group, around 55 percent of the company’s sales come from its luxury cosmetics brands. Of them, Sulwhasoo is responsible for 36 percent. Market insiders said budget cosmetics brands are also enduring fierce competition in the “red ocean” market, with more consumers looking for luxury, premium brands as the beauty trend now centers on anti-aging efforts. Industry experts see the causes of Sulwhasoo’s lackluster performance as coming from its brand positioning and sales strategy at duty-free stores. 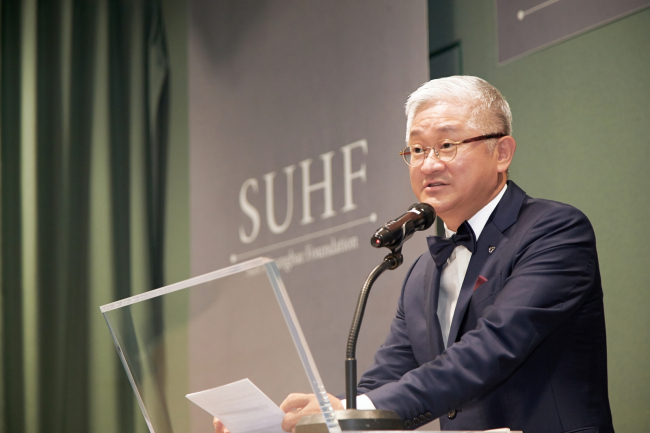 “In the luxury cosmetics market, Sulwhasoo has only focused on its simple, basic skin care products, whereas Whoo diversified its luxury product lineup and upgraded all the products of the brand,” said an industry insider surnamed Jung, who has been in charge of overseas sales for a cosmetics brand for 30 years. Amorepacific also restricted Chinese shoppers, or “daigou,” from purchasing in bulk at duty-free stores, he added. “As a result, Amorepacific could not stabilize its supply chain in China. But LG, unlike Amorepacific, rolled out flexible rules for daigou and increased their demand,” Jung added. Others added it may simply be the product design and brand concept that work better for Chinese customers, who prefer gold, royal and fancy images. “To Korean customers, design and concept of Whoo may be regarded as ‘too much.’ But Whoo wisely focused in the concept that can appeal to Chinese customers. Hiring Lee Young-ae as its main model was also very clever, because Hallyu stars like her are still very influential in the Chinese market,” said an industry insider who is very familiar to exporting cosmetics to China. Is overseas sales expansion only way? To overcome the situation, Amorepacific plans to once again focus on strengthening its luxury brand lineup, including cosmetics brand Amorepacific, which is a luxury skin care brand named after the company. The brand rolled out only 2,000 limited edition facial creams last year, priced at 750,000 won per bottle. The reason is largely due to weak sales of budget cosmetics brands such as Innisfree and Etude in the domestic market, as well as in China. In 2012, the company launched budget cosmetics brand Innisfree in China. It now operates 512 stores in cities like Hangzhou and Shanghai. As of last year, 50 percent of sales of Amorepacific’s Chinese corporation came from Innisfree. But sales had been on a decline amid competition with local players that launched brands like One-leaf with similar concepts -- natural and clean. “There are already too many budget cosmetics in China. That’s why Chinese tourists coming to Korea are now looking for luxury, premium cosmetics that they cannot find in their market,” said a market insider, adding that the trend is especially evident among Asian countries. The company said it will renew the Innisfree brand and debut Primera to China this year, aiming for 601 billion won in operating profit by the end of the year. It will also accelerate Sulwhasoo store openings in additional Chinese cities, and expand touch points in online retail in major e-commerce sites such as VIP.com and JD.com. Earlier this year, the cosmetics giant announced the business goal of securing a 10 percent increase in sales and a 24 percent increase in operating profit this year. The group said it would focus on investing in innovative beauty sectors such as customized cosmetics or overnight beauty items based on developing the customer experience. “The company believes in the value of traditional Korean beauty. It is also Chairman Suh Kyung-bae’s business philosophy to create beauty products that can instill Korean beauty, products with value that can last for a century,” said a company insider. Overseas expansion actually did pay off for Amorepacific last year. Despite its increased investment in overseas markets, both sales and operating profits inched up by 8 percent to 1.9 trillion won and 6 percent to 2.6 trillion won, respectively. But some say it is time for Amorepacific to bring in a new cash cow for practicality, referring to LG Healthcare & Household’s budget brand The Face Shop that bought Avon’s manufacturing facility in China last year. “It is time for Amorepacific to make the bold move and seriously consider active M&A ideas. M&A can offer positive opportunities in terms of global market expansion and investment for future. Especially when global beauty companies like Loreal and Unilever are buying Korean beauty brands, it is important for the company to take a strategic position to diversify brand portfolio for global competition,” said a researcher at Euromonitor International. Seo Yong-koo, a professor of business at Sookmyung Women’s University, said Amorepacific should not put all its risk in the Chinese market. Seo said since Amorepacific saw aggravating sales following its downfall in the Chinese market, the company experienced that its market portfolio is important. He added the group should also take the Muslim market into consideration, which will add up to 1.8 billion customers.